From pastels, to vintage, the world of fashion and design has reinvented the way women of different shapes, ethnicities and sizes feel about themselves through an aesthetic feel that is flattering, rotted in enhancing a specific figure, and giving each person an opportunity to express themselves. 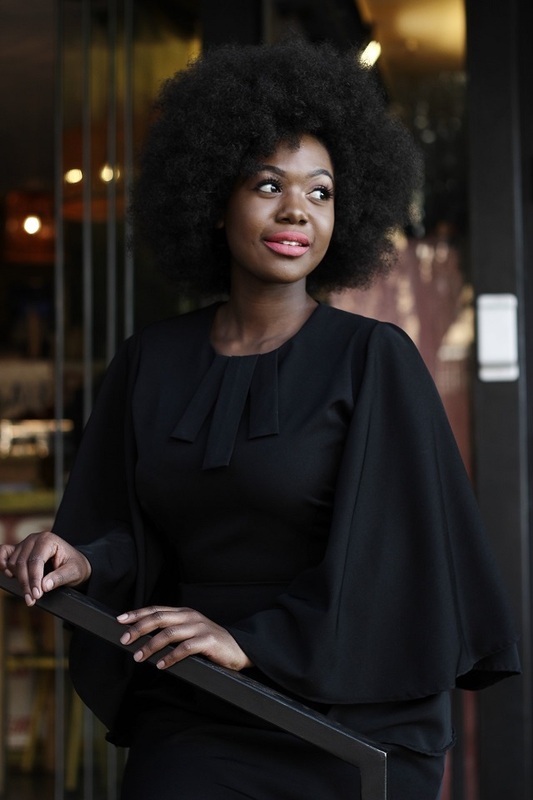 On the forefront of this movement of art and design is Meladi Montjane, a fashion maven who hails from Limpopo and founded the trendy Hayrick Fall, which focuses on creating garments that are tailor made to make anyone feel good and look good. Her love for creation is seen in her gift that allows her to be multifaceted and take design to a new level through not only creating garments, but also as a Masters graduate in architecture, Meladi is able to bring any vision to life from a dream house to a clothing garment. We had a chance to catch up with her, as she revealed the highs and lows of owning a clothing label namely Hayrick fall, and her life as a multifaceted designer. 1. Briefly tell us about your background; your childhood and what led to your pursuit of design? I'm from a lovely family of 5, my parents and two older sister. Obviously I’m the baby in the family. We moved from a rural village called Ga-Mphahlele to town in 1994 where I attended school from pre-primary all the way through to High School in Polokwane. We are a creative bunch of children, growing up I have always loved drawing and colouring. The clearest memory I have of being interested in the fashion industry is when I was 11 years old glancing over my older sister's sketches and attending my other sister's beauty pageants. I think it's hereditary, my grandmother sewed, my mom sows and well, I was the lucky one with the talent. I was drawn to it more than anything. 2. Have you always wanted to be a designer? No ways, as a child I was going to be an amazing Doctor, then a Forensic Investigator, an Environmentalist and I somehow ended up in Architecture. All great examples of my fixation with details. Although from a young age I took interest in fashion I did not understand the business of it, so I always brushed off my love for it. That was until I was in my third year of Architecture at the University of the Witwatersrand and I participated in my first fashion show. My life changed, it was possible; I fell in love with fashion. 3. Outside of hayrick fall, what else do you enjoy doing? I'm an Architect by profession, I consider it a multifaceted craft. You are a designer, inventor and writer at most. I love art, poetry books, I'm into feelings and expression as an art form. I could spend most of my day reading up on artists in different industries and their craft. 4. If you were to choose between architecture and fashion design which one would you do full time? Oh my goodness! I actually don't want to choose between the two. This might be detrimental to my health, most likely. Fortunately that time has not come as yet. My heart surely lives for Hayrick Fall, it is my baby, my brainchild. The fine line between pleasing the client and convincing the client of what is right for them. This applies in both architecture and fashion. And as a small business owner, capacity is a problem. Sometimes I'm unable to take all the jobs coming through and there are those month were work is low and I have employees to pay. 6. What do you do to keep yourself inspired? I do a lot of research , reading up on designers , learning new techniques being used in the industry studying work that is already out there. The internet is an amazing tool. 7. What are some of the difficulties of the type of work you do? As a bespoke designer clothing is seasonal and some seasons are not feasible. Each design is specific to a body type and style. This is fun and frustrating at times, there isn't a set out pattern or design. Other difficulties would be acquiring new clients. 8. How long did it take you to start your business? What steps did you take to become self-employed? My parents and siblings have been so supportive of my business and the venture I am on. It took about a year to get in off the ground and started. The first step was getting a name that resonates with me and my brand and registering the company. Then I bought machines and started up in my parent’s garage, I couldn't afford rental at the time and I had a full time job in architecture. I was working around the clock every single day. I started my business on my own so for the most part, I did all the work myself until I was able to hire and outsource some services. 9. What advice would you give to those intending to pursue the same career path as you do? Do your research, speak to designers and outlets, fashion is a tough industry and you have to be willing to make the necessary sacrifices. If your niche and become an expert in it. Concentrate on long term clientele relations, these keep the business going. And most importantly be prepared for the hard work. 10. How can people get in touch with your work? My work is available online on our website www.hayrickfall.com , Instagram @hayrickfall , Facebook Hayrick Fall and our contact details are meladi@hayrickfall.com / info@hayrickfall.com or people may call 079 065 3603. We do a variety of work ranging from bespoke bridal, everyday wear and special occasions. 11. What are some of the important bits about constructing a masterpiece? It all starts with the body; the shape, the skin tone. I think it's so important to explore our bodies and tone. We often ignore this and shy away from certain garments or colours. A lot of imagination and elegance is a great place to start for me. I want each garment to exude elegance and class. Execution being the ultimate goal, the craftsmanship of a garment is so important and speaks about the designer as a maker. 12. What is your ultimate dream? The ultimate dream is to have my own warehouse for constructing garments, design and outsourcing to out to designers who might be starting out but lacking in capacity. Creating jobs for young designer and opening up the industry. 13. Quote you live by? "start where you are, with what you have, knowing that what you have is enough"- Booker T. Washington. I remember as teenager reading "A man's gift makes room for him and brings him before great men"- Proverbs 18:16. It is so important to believe in your cause, to take it upon yourself to see things through, to start is important and to be consistent is life giving. If we never start God can't open a door we are not approaching. You may not have every single nitty gritty thing sorted out and you can not prepare enough for the mishaps, but what you can do it start and learn along the way. There is no bigger lie than "I am not enough and I don't have what it takes". So decide, decide to start where you are with what you have and grow with your purpose.